In a previous life Stuart Hogg, Course Manager at The West Lancashire GC was among the first to own the Wiedenmann Terra Float & Terra Seed. Last year, more by coincidence than by design, he found himself back in the market for an overseeder just as the Terra Float Air was re-engineered and relaunched with an added computerised pneumatic unit. 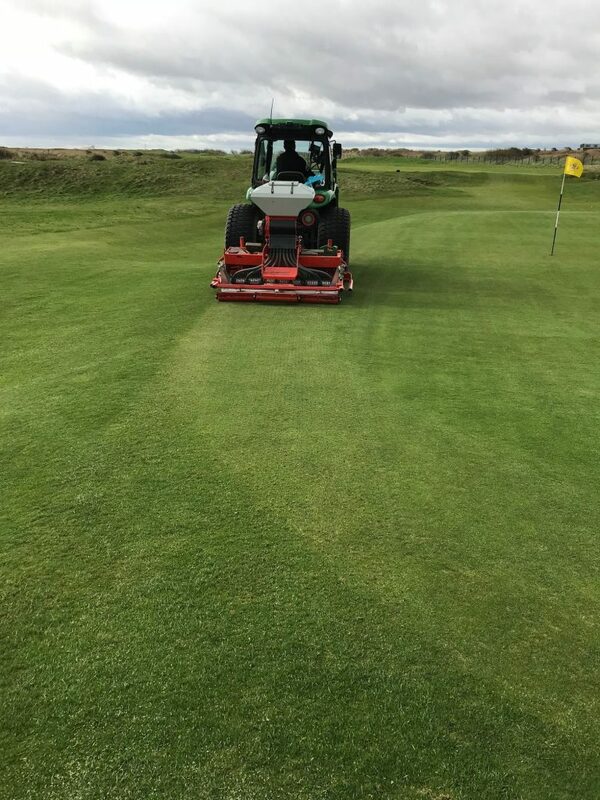 “We bought one of the original launch Terra Float and Terra Seed combinations in autumn 2010 when I was Course Manager at St Anne’s Old Links, on the Fylde coast. They served extremely well. When I moved to The West Lancashire in April 2015, I inherited a more traditional type seeder. For the first couple of seasons we made do then we hired in equipment. Last winter a funding package allowed us to invest in a new machine. Darren Barker at dealers, Balmers GM, showed me some others but I liked that the three Wiedenmann drums are floating so cope well with undulations of a links green. I knew I liked it before and the Air version was better again,” he said. Offering maximum accuracy at quantities as little as 1 g / m² the Terra Float Air, combines three units in one. A base unit aerates or loosens soil to 30 mm using either spikes or fine slits assuring a receptive seed bed either pre or post top dressing. Next the distribution of the seed is absolutely uniform via the air flow and deflector system. Finally, a brush and roller combination incorporates top dressing materials to the ground before smoothing the surface. With its very fine seed rollers exact calibration is achievable. Those with expensive or ‘rare seed’ can be confident of success while memory function on the control pad stores input and calibration data for the next use. The West Lancashire GC is a proud host of R&A and England Golf competitions as well as featuring in the Top 100 Golf Courses in Great Britain. It is one of England’s ten oldest clubs and will celebrate its 150th anniversary in 2023. 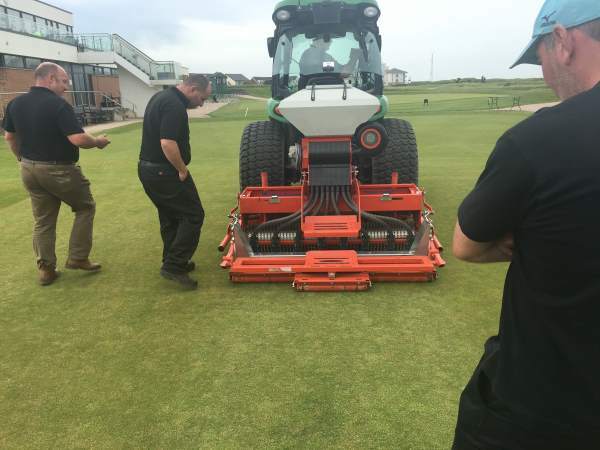 The role earmarked for the Wiedenmann Terra Float Air has been well considered to help deliver incremental improvements to the quality of the course and take advantage of the machine’s versatility and potential. “This purchase is not just about one area or one type of grass or indeed just limited to seeding,” said Stuart Hogg. “We want to be able to do tees, greens, fairways and walkways with different grass species. The fact that the seed delivery hoses are kept dry and clean with the airflow is a big plus. If we want we can brush the greens without overseeding or we can sarrel roll the greens. There is much that can be done. But for now we’re going with little and often; playing the long game. It will take a period of time before we see a change of any botanical composition in the grass but that’s where we want to be in seasons to come. Where the Air comes into its own is its high performance air stream which effortlessly directs precise amounts of the seed to the prepared perforated holes A series of steel deflector plates ensures uniform depositing of the seeds from a short distance while lifting the unit automatically triggers a shut off. “The in-cab control saves time and effort. Our team really likes this. If one of the greens, or a specific area is a bit weaker there’s no requirement to get out and recalibrate the machine. It’s a couple of presses of a button and the machine does it for you, storing the data for next time. You are far more in control of which green gets what and such versatility on a golf course makes the job a little bit easier,” concluded Stuart Hogg. Stuart Hogg is one of a rare breed of course managers having spent his entire career on links courses. 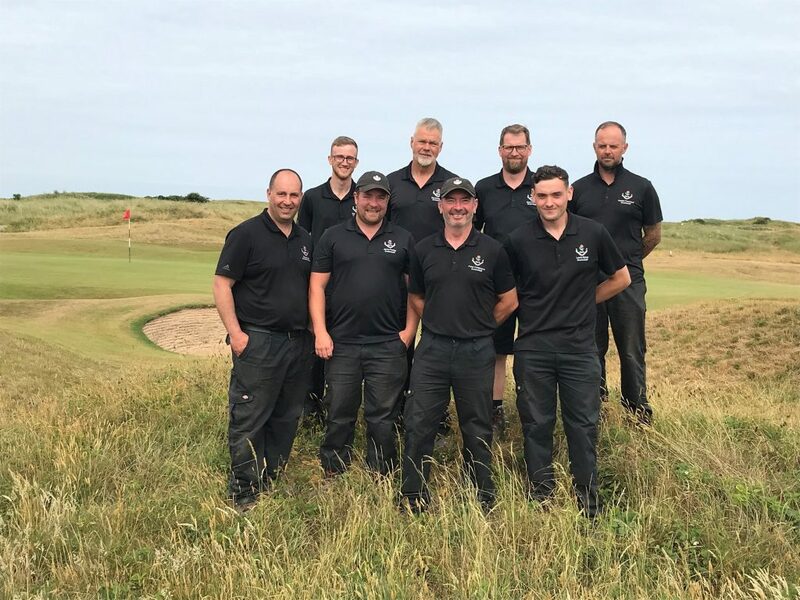 He took up his Course Manager post at The West Lancashire GC after 11 years at St Anne’s Old Links and before that spells at two other links courses, Fortrose & Rosemarkie GC on the Black Isle and West Kilbride GC at Seamill in Ayrshire. At The West Lancashire he is supported by a team of seven full time plus three seasonal staff.